Dru Yoga teacher training courses are usually non-residential and run for 2.5 to 3 years. Most of our courses consist of 9 x 4-day modules. In Sydney, our current course is in a single day format. 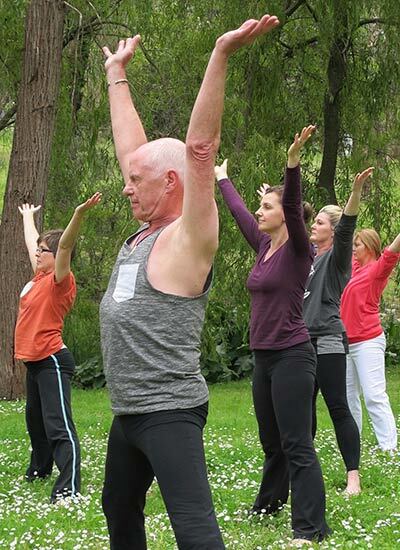 Here in Australasia you can do the Dru Yoga teacher training in Sydney, Brisbane, Adelaide, Melbourne, Perth, Albury Wodonga, Canberra and New Zealand. Dru’s in-depth knowledge of the body-energy system and how to teach so you simultaneously transform body, subtle energy, emotions and mind. anatomy and physiologyAll of this is clearly explained and illustrated in sixteen accompanying course manuals. For the Dru Yoga teacher training course format including the yoga course content, the Dru teacher training qualification and continuing professional development please download the Dru Yoga teacher training prospectus (pdf 2.55MB). Love the sound of our course format? It's tried and true! Join the growing community of students and graduates all over the world who are a testament to this.